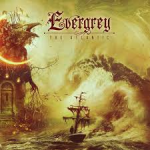 Share the post "Album review: EVERGREY – The Atlantic"
‘The Atlantic’ is the eleventh album from Evergrey, the masters of dark and atmospheric metal. Tom S Englund and the band have really worked on every detail of the album, be it the sea theme that runs through each song to making sure that melody remains the core of each song. ‘A Silent Arc’ is the perfect opener, highlighting all of the band’s musical strengths and abilities, with Tom S Englund’s vocals topping it all off. He has such an atmospheric singing style, not screaming away like some metal vocalists, rather he has the darkness in his voice and delivery. Rikard Zander adds a wonderful, 70′s Rainbow inspired bit of synth playing on ‘Secret Atlantis’, a song that also features one of the album’s finest guitar solos courtesy of Henrik Danhage. Evergrey never overdo a guitar solo, allowing instead the band’s trademark staccato riffs to add to the heaviness of the sound. Zander also has a leading role in the short instrumental ‘The Tidal’, which with the added effects sounds uncannily like Vangelis and quite unlike anything Evergrey have ever done before. ‘Departure’ is one of those slower songs that Evergrey do so well. Packed full of emotion from the vocals of Englund through to the soaring guitars and changes in the rhythm section’s tempo – it makes for wondrous listening on headphones. This entry was posted in ALBUM REVIEWS, ALBUM REVIEWS (Mobile), All Posts, PURE METAL (All posts), Pure Metal/Album reviews and tagged AFM Records, album, atmospheric, dark metal, Evergrey, melodic, metal, progressive, review, the Atlantic, Tom S Englund. Bookmark the permalink.